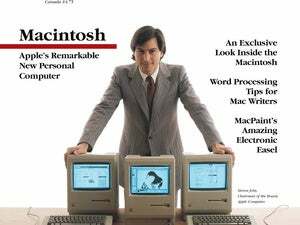 It was May 1998 and I was working as a features editor at Macworld magazine—and in those days, magazines were superheroes and websites were their plucky sidekicks. 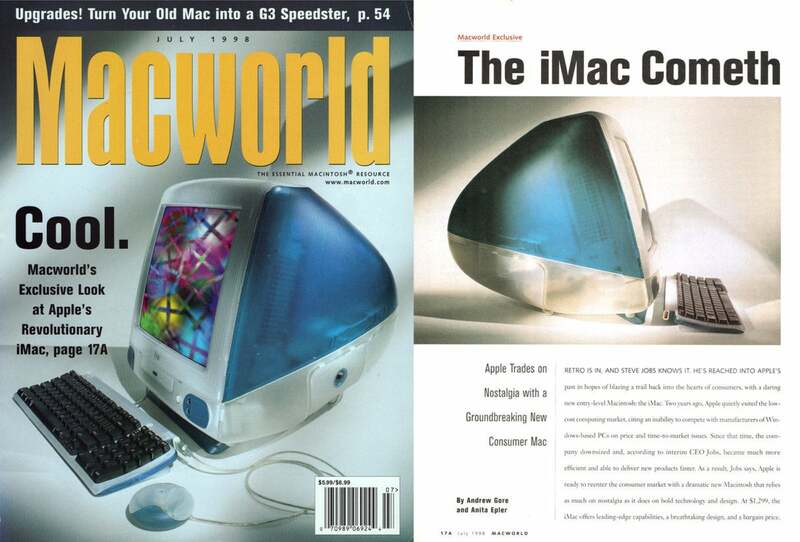 Monthly magazines had a relatively leisurely schedule, but the day the iMac was announced, Macworld was in the midst of “close”—the one week where we finalized every single page in the magazine, back to front, and transmitted them to our printing press in the midwest. You can’t add a single page to a print magazine—we could only add them four at a time, because the paper the magazine was printed on was actually a double-sized sheet of paper, folded in half to make four, with the folded ends all stuck together and bound to make the complete issue. And since we had started shipping pages for the issue, the table of contents and page numbering was locked—so we couldn’t add any numbers. So that historic cover says “page 17A.” Weird. The iMac was a dramatic right turn for the Mac product line, and is the perfect representation of the changes Steve Jobs was making to Apple’s culture at the time. Out went beige boxes, an uncountable collection of different model numbers, and a collection of Mac clones that were better than Apple’s Macs at every turn. But ironically, the iMac’s design was influenced by the very clone market that Steve Jobs killed. As an Apple marketing manager told Macworld back in 1998, the iMac was able to be designed and built in ten months because of the work Apple had done on something called CHRP, the Common Hardware Reference Platform. CHRP (and its predecessor, PReP) are now utterly forgotten, but there was a time when the PowerPC alliance of IBM, Apple, and Motorola worked together to create a hardware standard for computers that ran on PowerPC chips (like the G3 in the iMac) rather than Intel processors (like the Pentium II, which Apple ran speed tests against during its iMac unveiling). Essentially, CHRP was supposed to create a standard that was the PowerPC equivalent of the Intel PC—a set of hardware that could run all sorts of different operating systems, including Mac OS (Motorola announced a CHRP Mac clone, the StarMax Pro, which we tested but it never shipped), BeOS (which almost beat out NeXT to be the source of the replacement for Classic Mac OS), mkLinux, Windows NT (! ), and Rhapsody (soon to be renamed Mac OS X). The iMac wasn’t a CHRP computer, but it was “darn close,” as Macworld wrote in 1998. It used PC standard RAM, USB, and had an OpenFirmware ROM (meaning that, unlike older Macs that had ROM chips containing complex, machine-specific instruction sets, the iMac kept most of its hardware instructions in its main memory). Apple took all the work that went toward making generic PowerPC hardware, used what it wanted, discarded the rest (like the mandate that every CHRP computer feature a PC parallel port)—and ended up making the most distinctive Mac yet created. From the perspective of 2018, the iMac is history, and history is written by the victors. But in 1998, the iMac was controversial, especially among the sorts of dedicated Mac users who subscribed to Macworld. It ditched the floppy drive that had been on every single Mac to that date, as well as several ports—SCSI, serial, and ADB—that had been on basically every Mac since the Mac SE. Imagine Apple removing the headphone jack from the iPhone 7, multiplied by four. Literally every Mac accessory ever made was no longer compatible without an adapter. L. Goodman: I’m astounded by your defense of Apple’s decision not to include a floppy drive with the iMac.... I think the iMac is a fabulous-looking computer. It’s going to wow a lot of people. But a lot of potential buyers will sadly give the machine a pass when they discover that Apple skimped on a floppy drive and expansion slots. Mike Kemerer: I like the iMac’s design and low price, but I’m concerned about its lack of a SCSI connector.... how does Apple expect to sell home computers that can’t connect to all the equipment people have invested in... I’ll stick with my old system. Eric Wenocur: If Steve Jobs is so damn smart, why did he approve the next great Apple disaster, the iMac? I can’t believe that Apple would return to the consumer market by offering a Mac that is completely incompatible with the current installed base of Macs and software. No floppy drive?... No ADB, SCSI, or Mac serial ports?... There is such a thing as being too far ahead of your time, and the iMac is a good example. Anthony Randazzo: I would like to commend Apple on the iMac. It is everything that is Macintosh—innovative, daring, easy to use, and fast. Plus, I’m glad to see the floppy drive go. I never use floppies. The subtraction of the floppy drive and the addition of USB in the iMac just show that Apple is moving ahead, away from ancient and useless technologies. Robert M. Witt: People are still living in the past. Loosen up! I believe that Steve has seen the future: the iMac is the Internet Mac. It doesn’t need peripherals or floppies. It connects to the network, period. It works only on the Internet... If the iMac connects easily to the Internet, it could become the computer for the rest of the world. Loosen up, indeed. A sentiment we all might want to keep in mind the next time Apple eliminates something we’re comfortable with in order to push us to use the next big thing.